Please use the following information and photos to identify what shape brake pads you need for your 2002-2003 Subaru Impreza WRX. It is best to verify before ordering to avoid any delay or surprise when you go to install your new brake pads. The first thing to do is to locate and identify the build date of the vehicle. 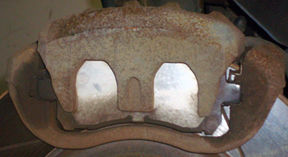 The month and year can be found on a metal plate in the drivers side door jamb down low and facing outward. Our information indicates the following combinations based on the build date of your WRX (NOT the model year) but to be safe use the pictures to verify what you need. There are several visual cues which you can identify without removing your wheels. If you select a 2002 or 2003 WRX in the car selector on the left side of each page you will see the D numbers listed as part of the drop down menu choices. If you still are unsure please contact us for further assistance.